I confess. I am a dessert addict. After I eat lunch or dinner, I always have to have something sweet to seal the meal…even if it is just a dinner mint. But in my efforts to eat less of the bad stuff (not all of it, mind you; just less! ), I was thrilled last year to learn the benefits of a marriage between an ice cream maker and ripe bananas. 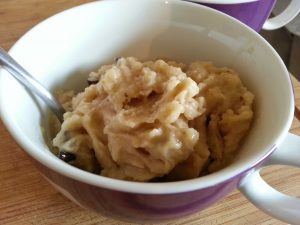 For this cool treat, you’ll need to have prepared some Yummy “Raw” Chocolate Chip Dough in advance. Then all you do is mash up the bananas. Add the alcohol (which provides both a nicer taste and texture…yeah, sure Dielle!) and the cookie dough chunks. Stir it up, put it in the machine, and let it do the rest of the work. It’s so easy. And it is so much better for you than ice cream.